The UCLA AtLAs California Health Initiative relies on creation of a community health repository, or biobank. Biobanking refers to the systematic collection and storage of a large number of blood, saliva or tissue "biospecimens" from patients as a resource for later clinical research. Biobanked samples provide a repository of DNA, proteins or mRNAs useful to answer diagnostic or treatment questions well before those questions are even posed, and as such are a cornerstone of research into individualized care. 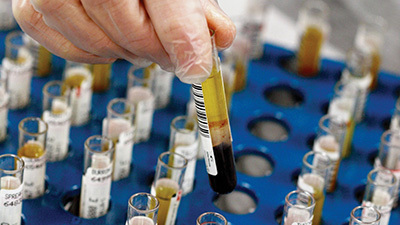 As an illustration, a researcher might want to examine samples in a biobank constructed from tissues from all patients with type 2 diabetes to search for biomarkers, or maybe even mutations in DNA, that predict a poor response to an intervention like metformin, a drug used to treat patients with diabetes. Nationwide biobanks already exist in European countries like Iceland or The Netherlands and were proposed for the US following President Obama’s 2015 State of the Union speech that called for enactment of a Precision Medicine Initiative. For the AtLAs community biobank, UCLA will start "modestly" by collecting close to 150,000 blood samples from a representative cross section of UCLA patients, from a variety of clinical laboratories at UCLA over a three-year period. Doing so presents immense organizational challenges, such as recruiting patients, collecting samples, and first and foremost, obtaining informed consent from patients. "Having this resource would allow us to perform whole-genome analysis on patients and connect this to their electronic health record," says Dr. Daniel Geschwind, associate vice chancellor of Precision Medicine in the UCLA Health System and senior associate dean of the David Geffen School of Medicine. If all goes well after three years, the goals ramp up considerably: "Over the long run, and as costs of genetic analyses go down, we would expand this initiative to our entire healthcare system, which consists of close to 5 million patients." Tissue banks already exist in hospitals and departments in medical centers, including many at UCLA. What is new is coordinating them and bringing them under one roof, which will create efficiencies and insure uniform quality. "We want to break down some historical departmental boundaries in the interest of conducting more collaborative and integrative research," says Geschwind." The Institute for Precision Health will serve as a major vehicle for achieving this." An added bonus of "population-based" healthcare surveys is to cast a wider net in reaching diverse populations of patients, including many groups previously underserved. Geschwind understands that disparity very well in his own field: "What we know about the genetics of autism thus far is based largely on European populations," he says. "But we now know that what is a genetic liability in a European population does not necessarily apply to Asians and African-Americans." Geschwind hopes to correct this imbalance, not just through his leadership of the new precision health institute but in the way he conducts his own research. He is helping build a tissue repository useful to assess ASD risk genes in African-American families, a large project funded by the National Institutes of Mental Health in partnership with the advocacy group Special Needs Network/LA, which is based in South Los Angeles. That group advocates for research and treatment for African American children with ASD and provides support for their families. UCLA is well-positioned geographically for inclusive initiatives like this, no matter what the health concern is. "The LA area is a microcosm of the world," Geschwind says. "Being located here helps us do even better work not just in ASD research but in all healthcare arenas." Steven Dubinett heads UCLA's Clinical and Translational Science Institute (CTSI), whose mission is to move innovative treatments developed in UCLA labs into the clinic. He says UCLA also has the people power required to manipulate complex data. "We know how to deal with large datasets relevant to health care and are training the next generation through graduate programs in bioinformatics and genomic research," says Dubinett. "Physicians used to make decisions based on 5 or 6 data points, but now our goal is to help them make them based on 1000s. We have the infrastructure and workforce to do that."